As many creators know, lines have been blurring lately – between film, television and digital; between traditional storytelling and branded content; between writing ad copy and narrative content; and between professional writing as a side hustle and as a full-time gig. 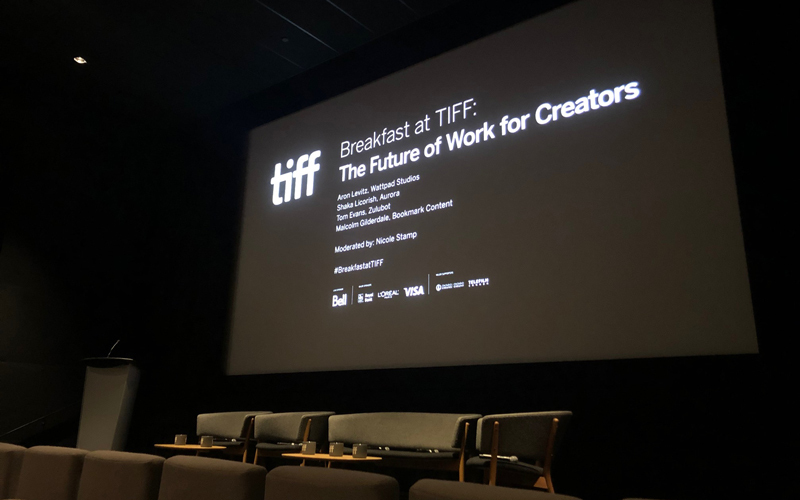 The latest Breakfast at TIFF industry session, taking place on Friday, March 29, 2019, dove into these shifting categories with its panel, The Future of Work for Creators. 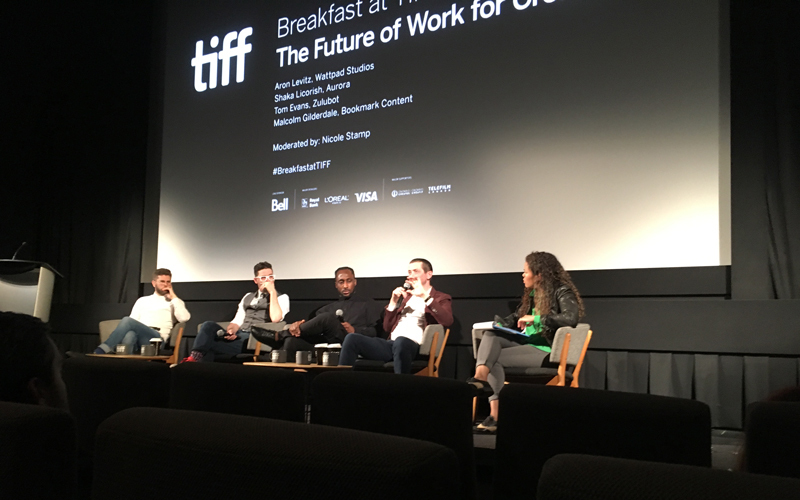 It explored how creators can break into emerging fields and largely non–film industry companies who have launched film and content studios, such as Wattpad, Shopify and more. Toronto’s film industry members gathered at TIFF Bell Lightbox to network over croissants and hear Tom Evans (Zulubot), Malcolm Gilderdale (Bookmark Content), Aron Levitz (Wattpad), Shaka Licorish (Aurora Cannabis) and moderator/writer-director Nicole Stamp share their insights on the rationale behind these new corporate ventures, and the kinds of stories and talent they seek. Each of the four panelists described the kinds of projects and platforms their companies are engaging with, and for which they need content. They also provided helpful backstories on their own individual career trajectories, on how they transitioned from more traditional fields like advertising or community organizing into overseeing these new and emerging multiplatform ventures. Malcolm Gilderdale, for example, came to Bookmark Content, a full-service global marketing company, via his previous work in advertising, copywriting and digital rebranding – including a successful redesign of TIFF’s own website. He described how Bookmark Content recently has been rebranding Air Canada’s in-flight magazine, En Route, with a launch scheduled for July 2019. This rebranding isn’t a traditional redesign. Rather, it’s broadening En Route’scurrent and more bounded status as a print magazine focused on content marketing. Gilderdale called the rebrand a move into an “ecosystem of content,” one that requires content unfold across platforms and extend the magazine’s life beyond the in-flight moment into digital, social, video, podcasts and more – which the proposed new tagline, “stories that travel,” illustrates well. Shaka Licorish, Head of Experience and Culture at Aurora Cannabis, described a different career trajectory – one that began in community organizing and mentorship in Toronto, and then led to working with Manifesto, programming film series at TIFF and Hot Docs, and executive producing live theatre. Licorish’s personal experience with a friend suffering a devastating illness led him to see the value and necessity of promoting medical cannabis for pain relief. That led him to Aurora, a startup in Canada’s brand new cannabis industry. As Licorish detailed, this industry needs dynamic storytellers to help the public un-learn as much as learn about the product, and thus combat inaccurate, fear-mongering narratives about medical, as opposed to recreational, cannabis use. Licorish acknowledged this can be a challenge, especially for social media and content marketing. The Cannabis Act, passed in October 2018, has constraints that would challenge even the most imaginative marketer: materials cannot promote the use of cannabis by featuring “people, nature, or animals” (!). Unlike already-established industries, however, this one is shifting daily. Aurora and other cannabis companies are pushing back at these constraints and as they succeed, a new storytelling landscape will open. Content creators might thrive if they enjoy telling stories for startups and an industry that is scaling and changing daily – and one that, as Licorish describes, makes a real difference in easing people’s suffering. Tom Evans, Zulubot; Aron Levitz, Wattpad; Shaka Licorish, Aurora Cannabis; Malcolm Gilderdale, Bookmark Content; and Nicole Stamp, moderator. Aron Levitz made his way to Wattpad from his lifelong interest in the intersection of art and technology. His degree in Mechanical Engineering and passion for entrepreneurialism brought him to Wattpad in its early days, as a then-emerging social network for readers and writers. Since then, Wattpad has grown into a global community of 70 million, with content written in more than 50 languages worldwide. Like Licorish, Levitz got in early. He has grown with it, and is now Head of Wattpad Studios. Wattpad also launched its own book publishing division, and both new divisions tap undiscovered talent here in Canada and around the world. On Wattpad, as Levitz described, each writer’s relationship to their readers is serialized and transactional. One’s content and community unfold and evolve in real-time. It’s more akin to playing Fortnite than posting on Facebook. In an entertainment landscape that tends to play it safe (Levitz noted 184 sequels and reboots are currently in production), Wattpad drives new stories, storytellers and IP. Its data reveals how, for example, a seemingly-risky/niche queer romance might not be a risk – not if it already has millions of “reads,” or an engaged audience, already built in. Tom Evans came from a background in directing and producing documentary films to Zulubot, a boutique “next generation content company” in global ad agency Zulu Alpha Kilo. Evans tracked how much he’s seeing both long- and short-form advertising content blur the boundary between storytelling and brand experiences, and stories that move between and among distinct platforms and media. Zulubot is also reworking the traditional ad agency business model for media production. They employ freelance directors unaffiliated with a particular agent or company. Evans himself transitioned out of traditional documentary filmmaking into directing and producing branded content. He noted that in the past, the goal was to produce this content as quickly and cheaply as possible. At Zulubot now, though, they seek storytelling-driven content with budgets in the $300K to 700K range to back up, and enhance, the end result. Throughout the discussion, it became clear that emerging creators, both as individuals and as small, nimble teams, can get in on these new opportunities. Being emerging may even be an advantage over those who have traditional agented relationships. Being able to skate across platforms and boundaries as a storyteller – writing, directing, producing, and post-producing digital content – can be an asset in this new future. Certainly, each panelist made clear they are more than happy to hear your pitches, so start researching, think broadly, and don’t be shy – especially if you have stories that are ready to travel!